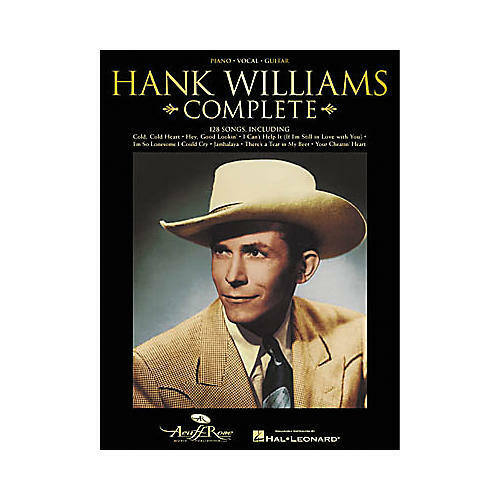 The Hank Williams Complete Songbook from Hal Leonard contains every song written by country music legend Hank Williams. Includes 128 in all: "Cold, Cold Heart," "Hey, Good Lookin'," "Honky Tonkin'," "I Ain't Got Nothing but Time," "I Can't Help It (If I'm Still in Love with You)," "I Saw the Light," "I'm a Long Gone Daddy," "I'm So Lonesome I Could Cry," "Jambalaya (On the Bayou)," "Jesus Is Calling," "A Mansion on the Hill," "My Son Calls Another Man Daddy," "There's a Tear in My Beer," "Your Cheatin' Heart," and many more! Also includes a biography.